You are here: Home / Blog / Is it good to switch for a Millets based Diet? Is it good to switch for a Millets based Diet? There is no doubt about Millets is one of the superfood’s in our diet and nutrition chain. There are various media sources, Grocery outlet, Natural Food stores touting about Millets diet benefits, including weight loss. 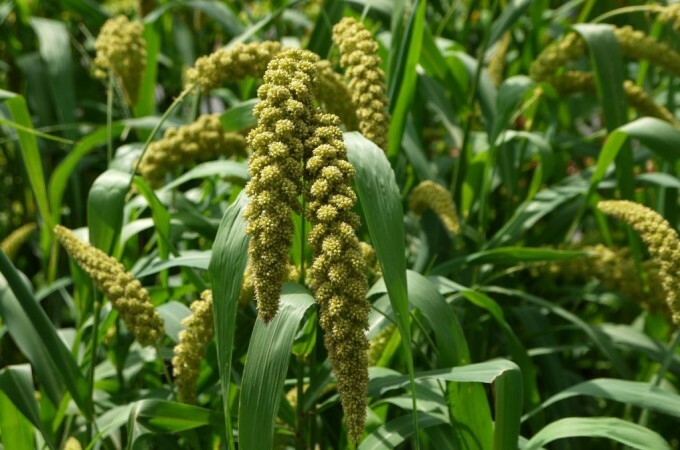 On the contrary, Millets do have limitations, especially to women who are deficient in Thyroid hormone, or already having hypothyroidism or thyroid deficiency. While millet is gluten free, but contains goitrogens. Goitrogens are compounds in the food that suppress or reduces the thyroid activity by blocking the activity of TPO enzyme. This can lead to goiter or, can also lead to thyroid deficiency. Soy is another big source of goitrogens. It blocks the activity of the TPO enzyme. Fermented soy is okay with moderation being the key. Millets has its own merit, providing more than 20% of daily value of protein, fiber, B Vitamins, Magnesium, Iron, Manganese and Phosphorus. Millets can be an excellent part of our diet, but it needs to be in moderation and needs to be complemented, it should not be overdone. Don’t over do it. Have complementary food that supports Thyroid function, especially, SeaWeed (Kelp), Yogurt (Curd), Milk, beans and nuts as part of your diet. Preparing Pathrode using Seaweed (kelp) instead of methi leaves would mitigate the deficiencies that are targeted by Goitrogens. Cooking longer increases the goitrogens activity!! Neer Dosa recipe using foxtail millet is a good alternative that takes very less cooking time. Note – Rice and Oats do not have the blocking effect on the TPO enzymes and are devoid of goitrogens. Millets, especially pearl millet is also high in oxalates. This can lead to kidney stones. Proper cooking method needs to be followed to avoid this. Millets contains certain enzyme inhibitors and Phytic acid. Phytic acid acts as a binder, that binds important minerals and not allowing the body to absorb the nutrients and minerals. Phytic acid is considered an anti-nutrient. Phytic acid leads to bad bone health and tooth decay. Also, blocks absorption of Iron and Magnesium. To overcome this and to get rid of the Phytic acid, it is advised to soak the millets for 16 to 24 hours. Most preferred way would be to soak in a slightly warm water with a teaspoon of freshly squeezed lemon added to this water. Warm water and acidic nature of lemon juice helps in eliminating Phytic acid. Before cooking rinse the soaked millets. Millets are by nature have heating property, increases Pitta and Vatha. But reduces the vikruthi of Kapha (decreases Kapha) due to it heating property. To avoid the Vatha dosha, follow the process of soaking as explained above and cook before consuming. If it generates lot of heat in the body, it would be ideal to eat along with Mung beans (Hesaru Kalu) salad or Hesaru Kalu kosambari. Even Millet pongal prepared using Moong Dal (Hesaru Bele) also helps in neutralizing the heating effect. Drinking Moong Dal (Hesaru Bele) paanaka/juice after eating Millets based food also helps in neutralizing the heating effect. If you are already prone to Thyroid issues and taking medications, please consult your doctor about adding millets to your diet. Do not completely switch to millet diet. Take it slow. Heed to the age old saying, “Have balance in Life and balance in your food. It takes care of you!”. This article is for information purpose only. Please consult your physician before start this or any diet. startdesi is a young startup with a vision to revive and promote our traditional and ancient lifestyle. We believe in a sustainable and holistic approach towards life. We have started with our special category of forgotten foods. Its our endeavour to bring the most natural and best food to your dining table.